If you need a quick, yet accurate translation, look no further! I apply my expertise in professional Spanish proofreading and editing, to every translation project that I handle at no additional charge for my valuable clients, to assure that they will receive what they seek perfectly translated and punctuated text without the loss of context or intended message. I do only human translation and under no circumstance do I rely on or use translation software, I use some tools like dictionaries or investigate on the web to provide you the best translation. A final note: As a general rule, and unless I am instructed otherwise, I will respect and duplicate the format of the source text. 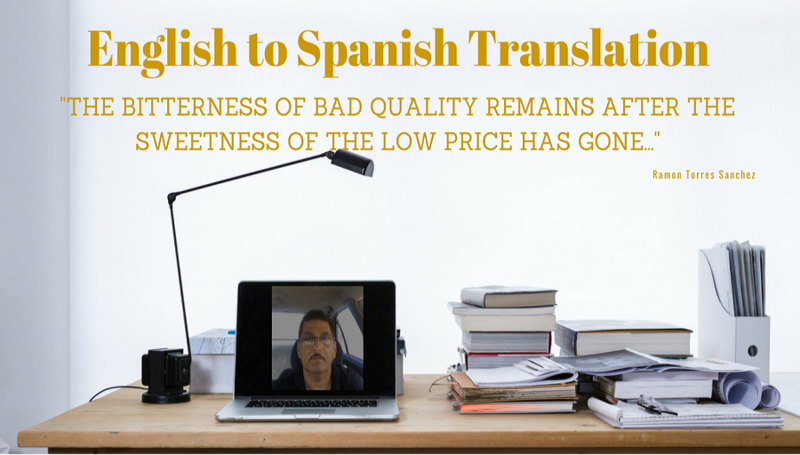 English-Spanish translation over any topic! MS Word, excel,powerpoint, publisher, editable pdf or text document with the source file, also indicate if you have any priority or requirements on your project. it is always a pleasure working with Ramon. Thank you again for the opportunity, a pleasure working for you! Ramon is very efficient and it is a pleasure to work with him. Ramon is a very reliable translator. I am very satisfied. Thank you Polo, it has been a pleasure to work with you once again, thank you for the opportunity! I recommend Ramon. He was very quick in responding and very accommodating. Thanks! Great client, thank you very much for the opportunity Polo. Great experience! Ramon did exactly what I was looking for and responded right away. I highly recommend him and look forward to sending more work his way. Ramon is very professional. The translation he did for us organized in a manner that is easy for us to follow. Very fast execution. Easy to communicate with. Good translation. If you’re looking for professionalism, honesty, accuracy and speed in your translation project at affordable prices, I might be the person you are looking for. As Spanish translator,...Read moreIf you’re looking for professionalism, honesty, accuracy and speed in your translation project at affordable prices, I might be the person you are looking for. As Spanish translator, I use proper international Spanish. I apply the Spanish grammatical rules that I learned during my 17 years of intense study in my country, México. •	Follow STYLE GUIDE FOR SPANISH TRANSLATION AND LOCALIZATION PROJECTS to ensure legal and ethical obligations to the customer. If you are looking for someone with excellent communication skills who provides top quality translations at affordable prices, I`m the person you are looking for.